Smart Droitwich Spa hotel close to Birmingham, with free WiFi and breakfast includedThe Holiday Inn Express® Droitwich Spa hotel is just south of Birmingham in historic Droitwich Spa.Right beside the M5 motorway, the hotel is a 20-minute drive from Worcester and a 30-minute drive from Birmingham. You can also reach Birmingham city center via direct trains from Droitwich Station. The popular Lido outdoor saltwater pool and Hanbury Hall and Gardens are just moments away by car. Costumed actors recreate medieval life at nearby Warwick Castle. Take the kids to spot tigers, elephants and rhinos at West Midland Safari Park. Here for work? You can host events in the hotel's 5 naturally lit meeting rooms, with a Business Centre and catering available. NEC trade shows are a short drive away.At this hotel you can enjoy:- Free WiFi- Free on-site parking- Express Start™ breakfast included in the room rate- All Day DiningNext Generation rooms are designed with your comfort in mind, including high quality bedding and blackout curtains. You can even bring along the family dog at no extra cost. Start the day with a generous breakfast buffet, including hot selections. Enjoy a tasty evening meal in the Great Room lounge, then relax with a pint in the hotel bar. 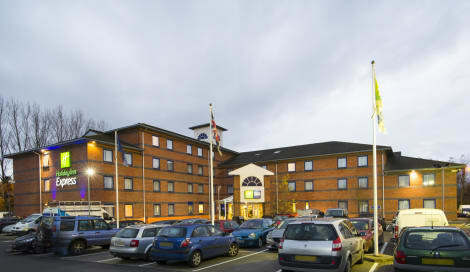 This comfortable hotel is situated in Droitwich. Those wishing to escape the hustle and bustle of daily routine will find peace and tranquillity at this establishment. Pets are not allowed at this property. This ancient settlement was originally known for its substantial salt deposits and had become a highly desirable spa centre by the Victorian period. Today, Droitwich is well regarded for its attractive Tudor architecture, and features one of the country's most beloved lidos. Droitwich is the home of one of the Midlands' great mansions, Chateau Impney, a Grade II listed landmark that was built in the 1870s and emulates the style of a majestic French castle. The building, which was once the residence of the affluent Victorian industrialist and politician Job Corbett, is now a popular conference centre and one of the finest of all Droitwich hotels. Originally opened in the 1930s, and reopened in 2007, Droitwich Spa Lido attracts large numbers of families during the school summer holidays. The open-air swimming pool is next to a unique Art Deco landmark, and is now one of only a very small number of lidos still open in the country. Other acclaimed attractions in the town include the Webbs of Wychbold garden centre and the Zombie Boot Camp, the latter of which is the leading 'zombie experience' attraction in the U.K. Consider dining at the award-winning Gardeners Arms restaurant, which has won a prestigious CAMRA Pub of the Season award for its delightful British dishes. For some delicious Indian food, head to Spice Fusion, or visit the Portofino restaurant for some wonderful Italian classics. Other great hotels in the town include the friendly and affordable Travelodge Droitwich and the enchanting St Andrews Town Hall Hotel with its picturesque exterior. If you have the time, don't forget to visit the charismatic Roman city of Worcester, which is best known for its imposing medieval cathedral. The city, which was once a leading centre for porcelain production, is also famed for its historic cricket ground and overlooks Britain's longest river, the Severn. Few landscapes captivate the senses more than the Malvern Hills, an Area of Outstanding Natural Beauty and a place of tranquil inspiration for one of the country's finest composers, Sir Edward Elgar. If you travel due east of the highest hill, the 425m high Worcestershire Beacon, you will not find any higher hills until you reach the Ural Mountains on the European-Asian border in Russia.